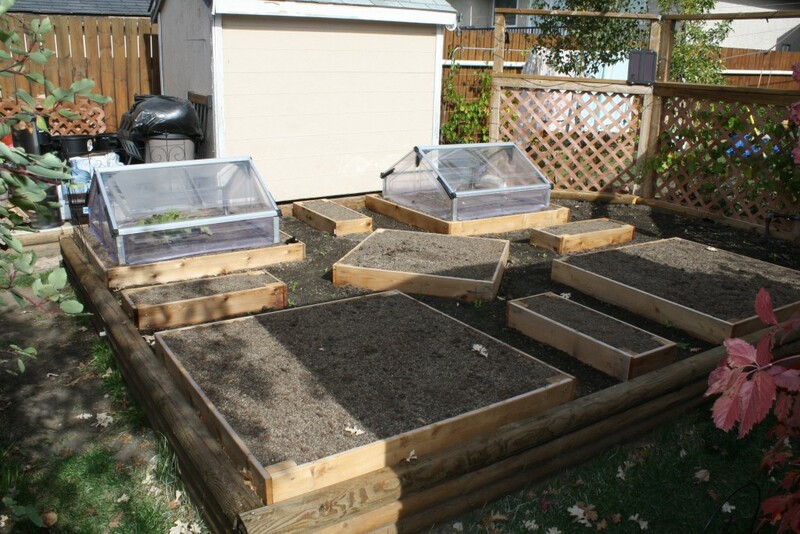 It is finally Fall and we had a busy summer carrying out a whole bunch of permaculture projects on one our own homes. 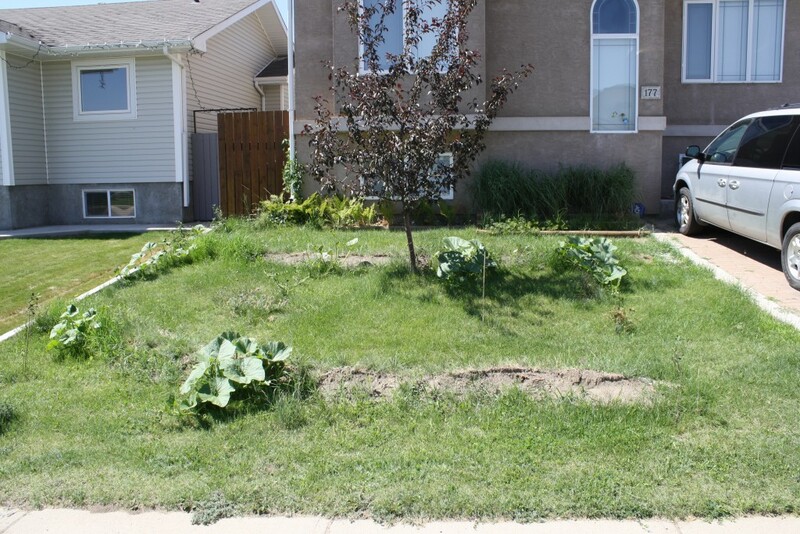 From May to October 2015 we surveyed elevation, installed roof rainwater harvesting, installed swales, installed wicking beds, converted an existing garden into a giant wicking bed, installed a morel mushroom bed, and planted an array of grasses, forbs, shrubs, and trees. 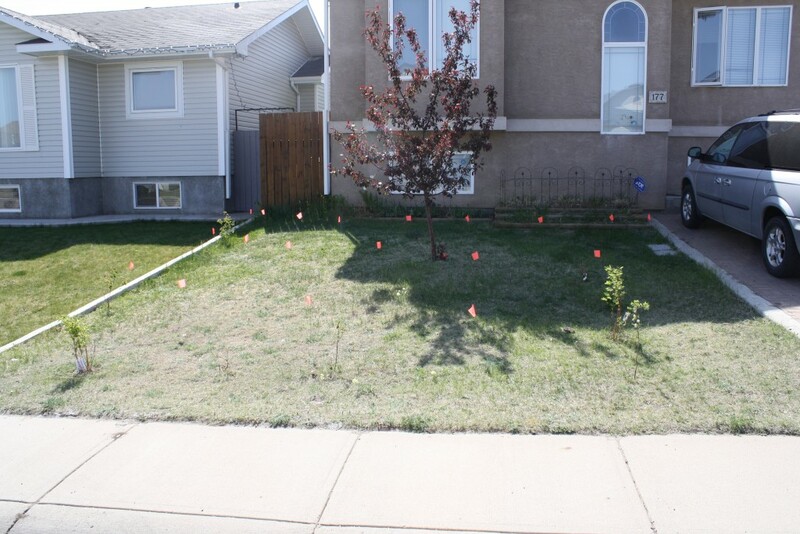 The east-facing front yard was seeded with drought tolerant native grasses, forbs, and shrubs in 2002. Upwards of 70 perennial species have been planted in the years since we purchased the house. 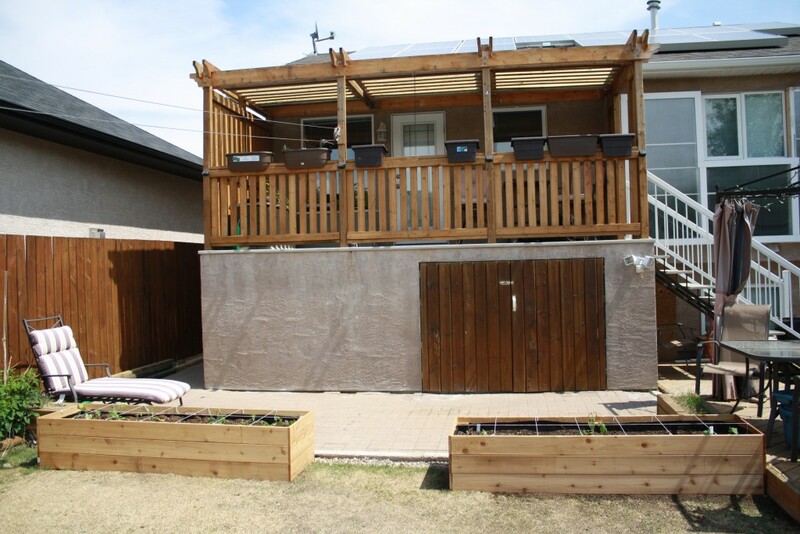 The end result was that rainwater and water from the roof gutter (top left corner of pictures/corner of the house) were sufficient to water the plants. However, the dominant grass was blue grama (Bouteloua gracilis), which is a shallow rooted warm season species. 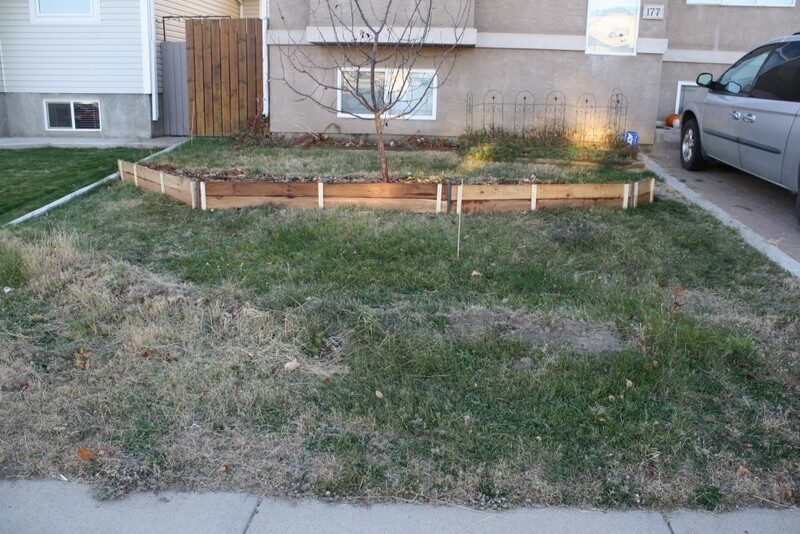 Because of foot traffic and the shallow nature of blue grama’s roots, the soil was heavily compacted and rainwater typically ran off the property onto the street. While native species are well adapted to grow in such conditions, this site has significantly higher potential for productivity. 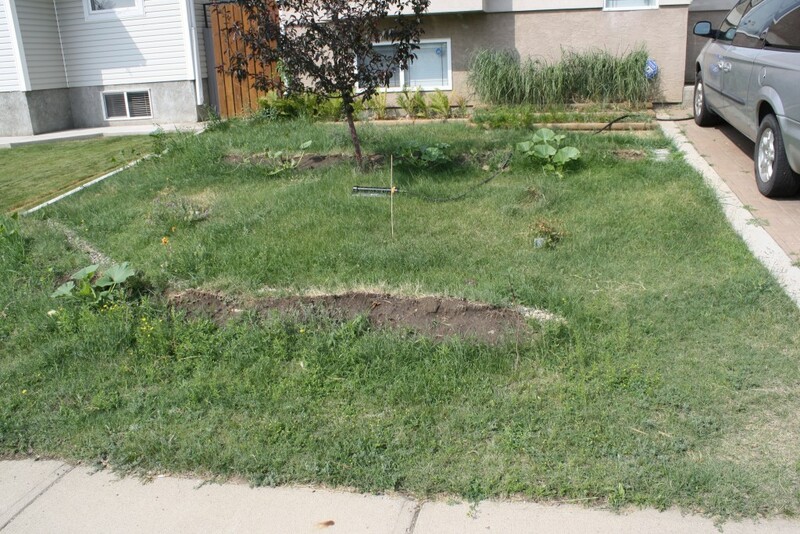 Grass height never exceeded 6 inches/15 cm, making mowing a twice to four times per year affair. Which is great because I hate mowing. 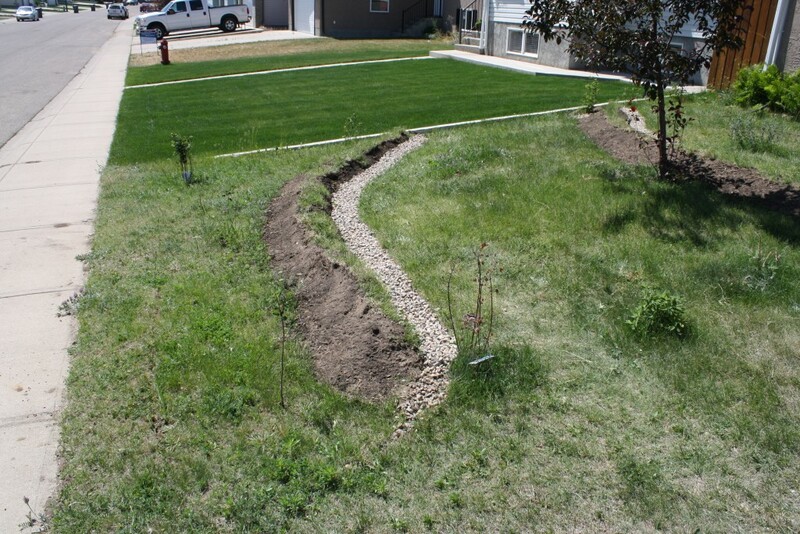 After surveying elevation and flagging the desired contours, three swales were chosen to be dug. However, three were quickly reduced to two, given the small space. 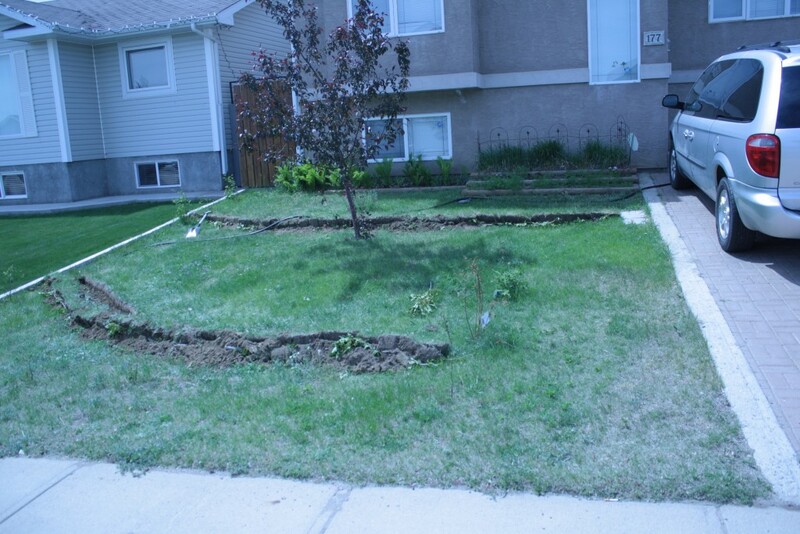 Swales were dug to a depth of 12 inches/30 cm, and weeping tile and gravel were put in. 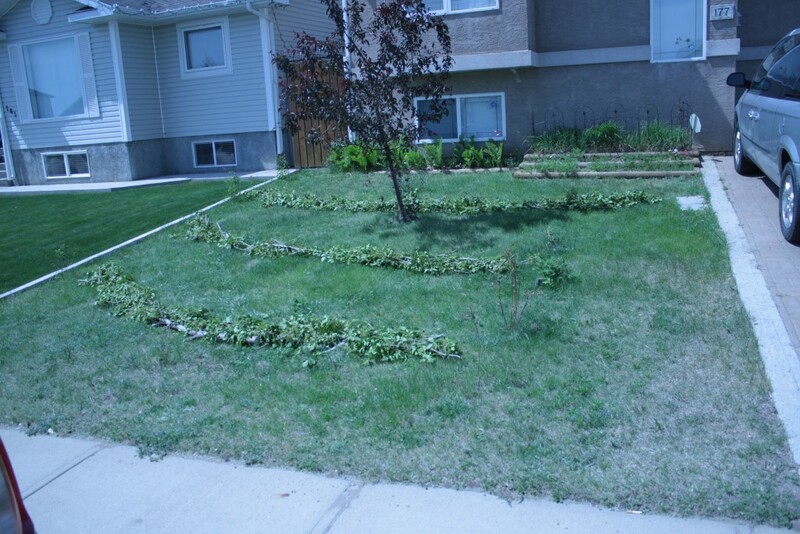 Green ash trees from the backyard were coppiced to provide some organic matter for the downslope beds. 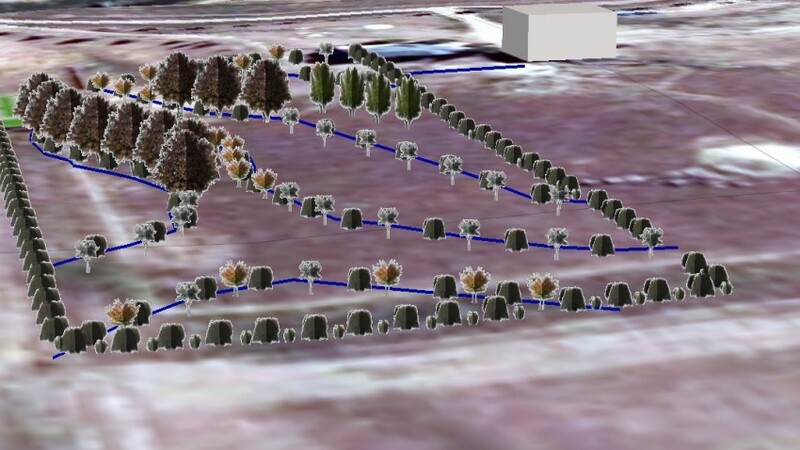 The excavated topsoil from the swales was placed on top of the tree branches and leaves to form very simple hugelkultur beds, with a total elevation of 8 to 12 inches/20 cm to 30 cm. 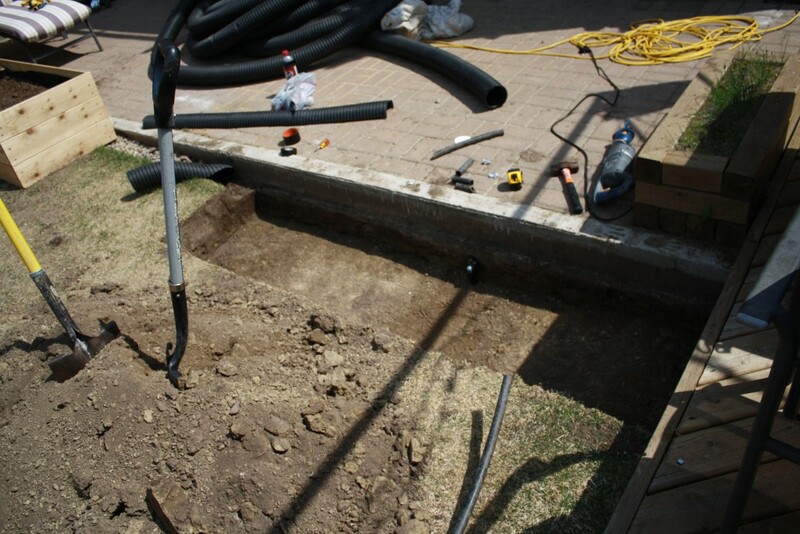 We used a hose to fill the swales, and it was apparent just how compacted the subsoil was–the water was very slow to drain even though the soil texture ranges between sandy loam and loamy sand. After several deep waterings (we have been in drought since Spring 2015), the compaction problems are subsiding, and taller grass species including switchgrass (Panicum virgatum), plains rough fescue (Festuca hallii), and big bluestem (Andropogon gerardii) are now spreading. 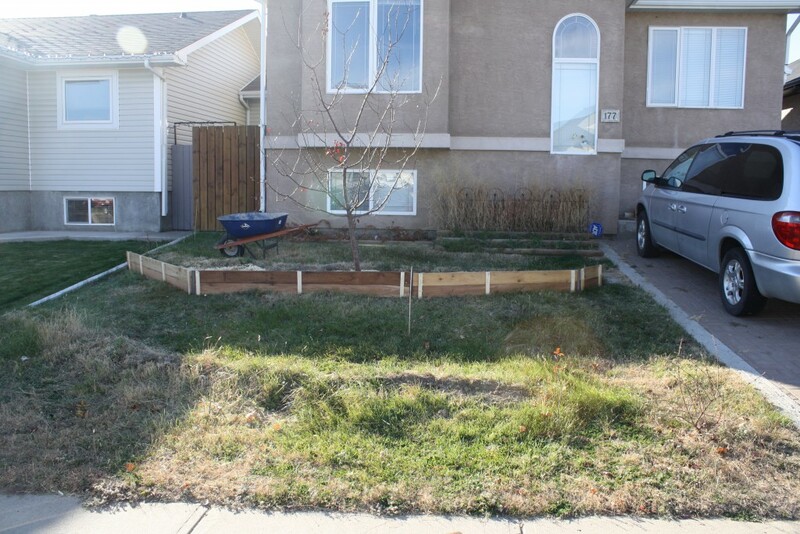 We have planted have saskatoons (Amelanchier alnifolia), hascaps (Lonicera caerulea ), and silver sage (Artemisia cana), as a hedgerow, but planted more along the swale beds. Silver sage is unique for its ability to provide water to surrounding plants by moving water deep in its roots to its shallow roots and outward, in a process called “hydraulic lift”. Aside from being aromatic and drought hardy, silver sage has also been shown to increase nitrogen uptake and cycling. Finally, we ordered some paw paws (Asimina triloba) from Green Barn Farm. Paw Paw, or wild banana, is native to eastern North America and also produces its largest fruit, weighing more than a pound (510 g). 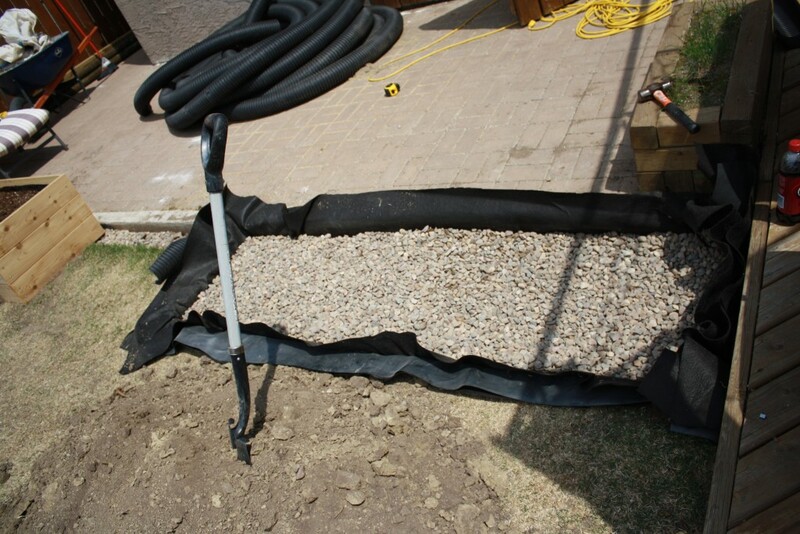 This stock is especially cold tolerant, and we hope well suited for Medicine Hat. Finally, with the subirrigation and water wicking below the swales, we decided to trial a mushroom bed. 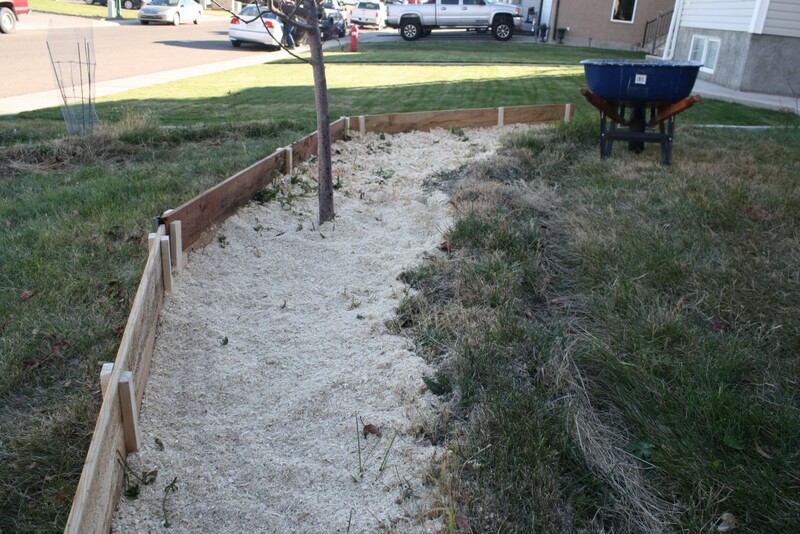 We spiked in a cedar retaining wall, laid down softwood sawdust and chips mixed with gypsum, limestone, oats, compost, and fertilizer. We purchased two varieties of morel (Morchella species) from Denmark and inoculated the mix. 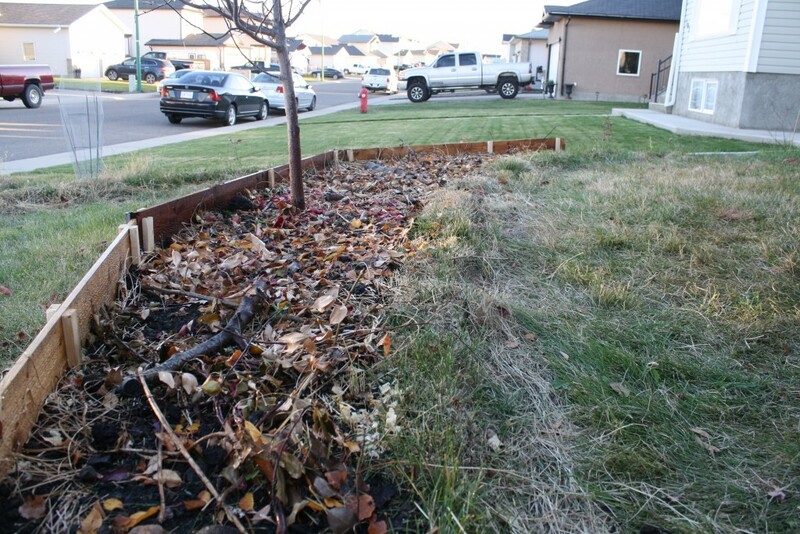 We covered the mix with thick layer of additional compost and leaves. 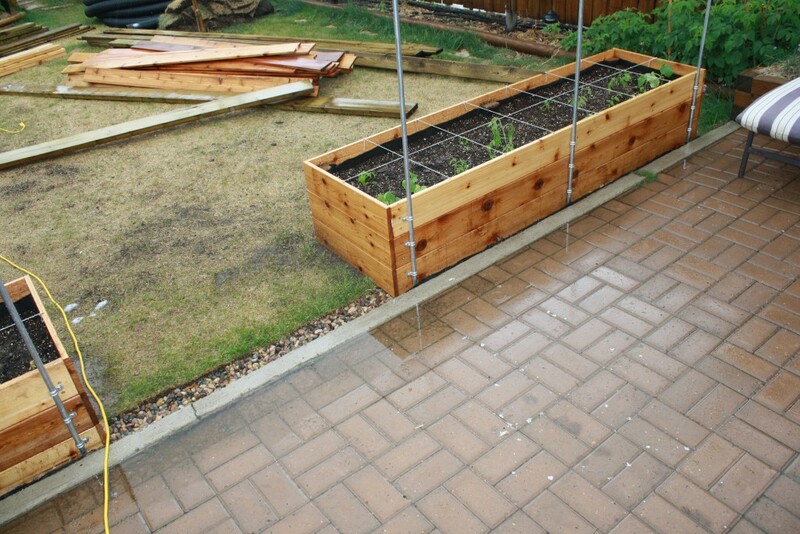 By capturing screened rainwater from the roof, we can provide much of the annual water needs of our garden, which is approximately 12 x 16 ft. As the sandy soil is very quick to drain, we felt a wicking bed with its built-in storage was the best way to get through dry times. 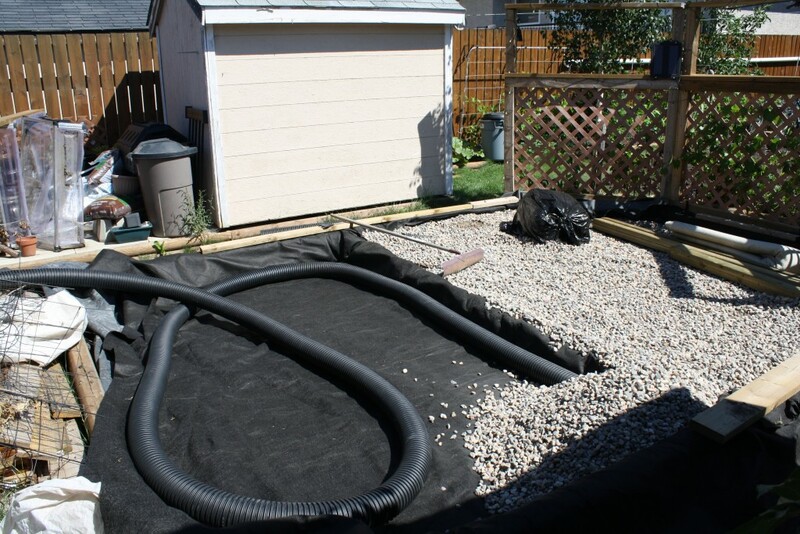 Water is fed in with 3 inch white PVC, and a 1 inch white PVC overflow pipe were put in after the conversion to a wicking bed. 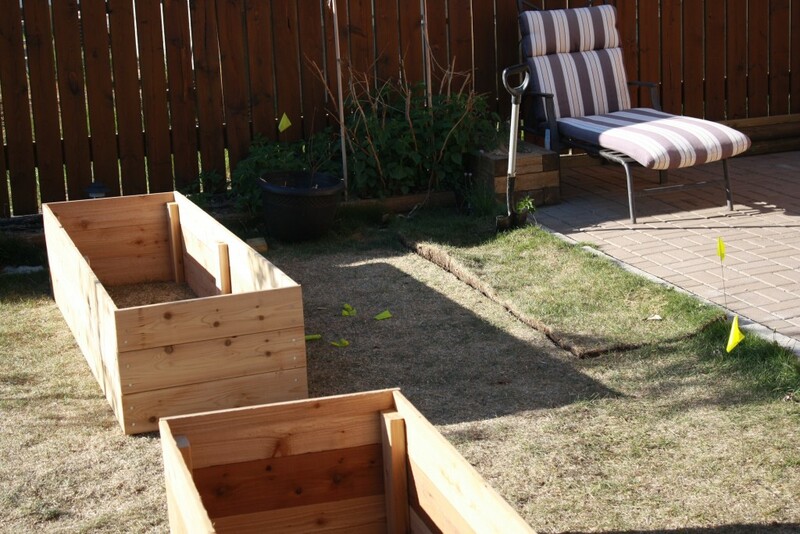 As we had limited space to store soil, we converted each half of the garden separately. 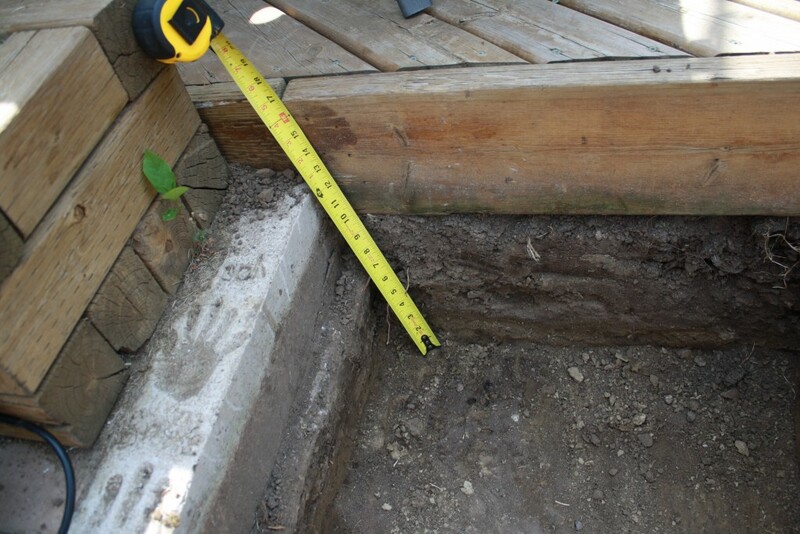 We dug out the soil down to a depth of 12 inches (30 cm). 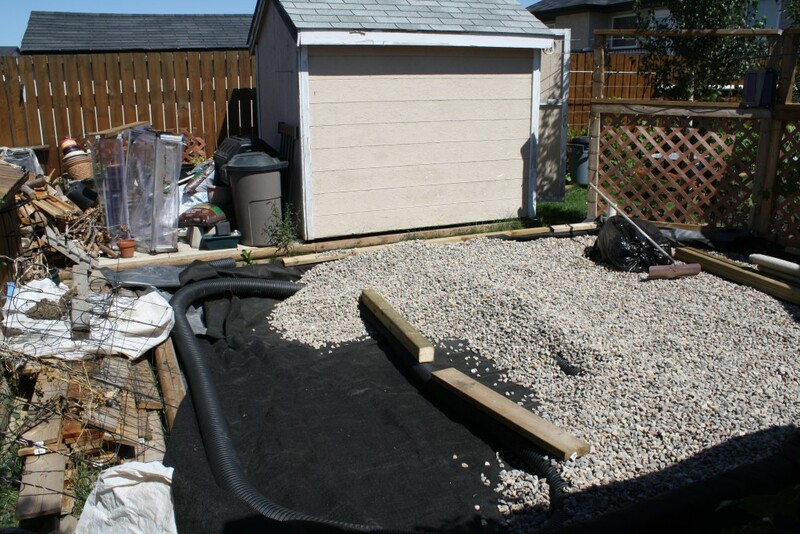 We laid down landscape fabric, EPDM pond liner, another layer of landscape fabric, weeping tile, and topped it with gravel. 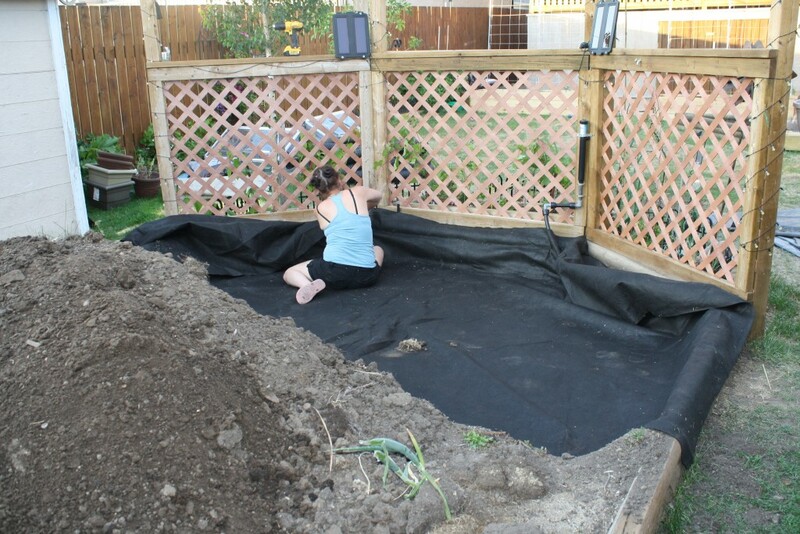 We also divided the wicking bed in with a 4 inch divider with the reasoning that if the pond liner was punctured, at least half of the garden should retain water. 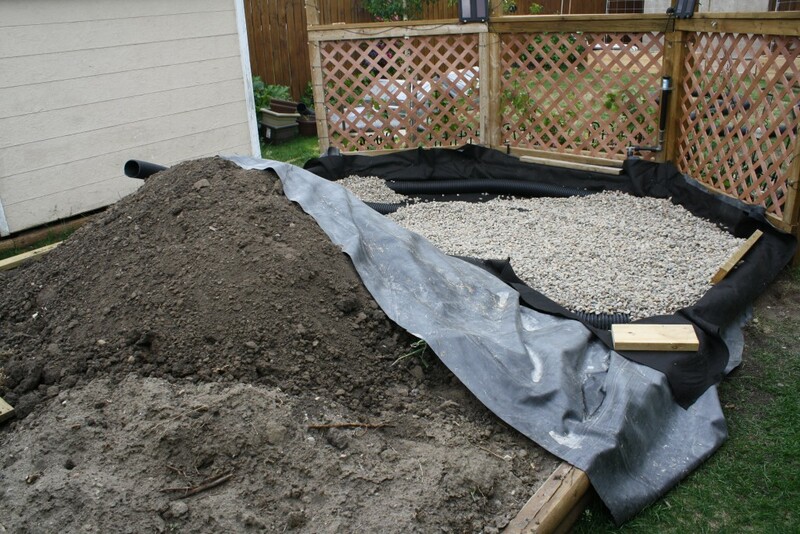 Gravel was leveled to a total depth of 10 inches (25 cm) above the pond liner. 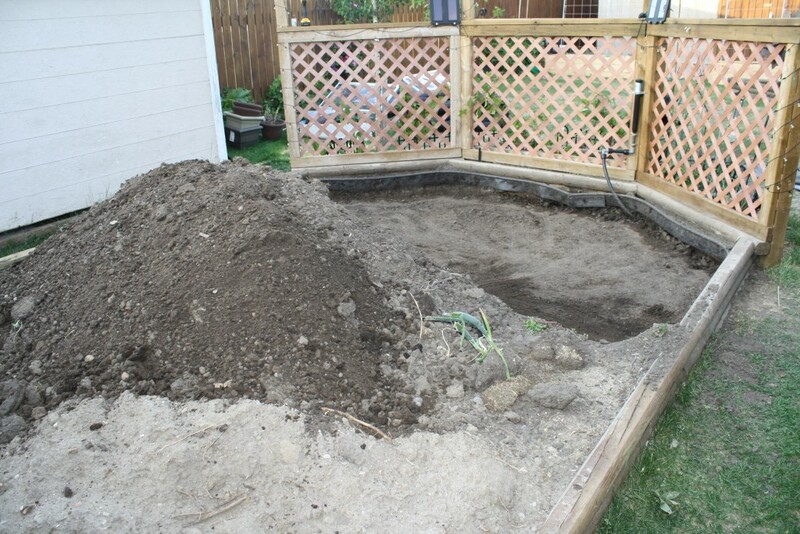 Topsoil was restored to a depth of 2 inches, with more placed in raised beds. 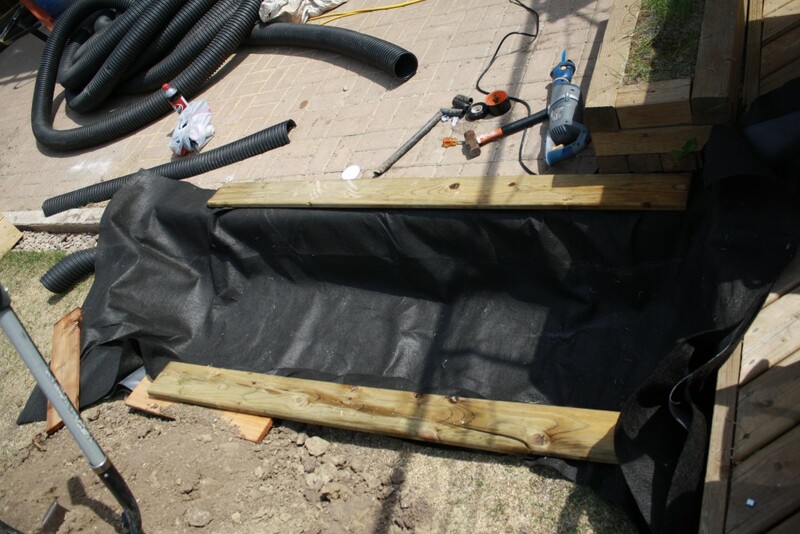 We are using pressure treated wood for the frame as the water is isolated from the wood by the pond liner. 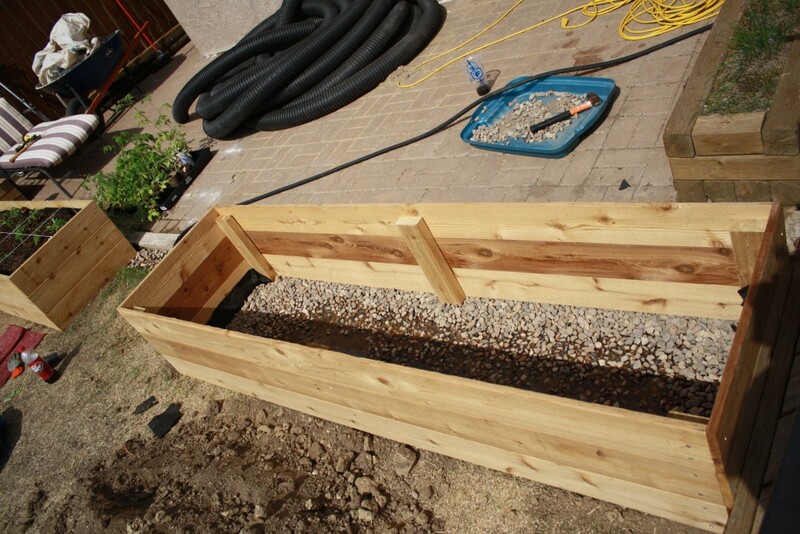 We decided to capture rainwater off the paving stone patio, providing a low maintenance supply of water for 2 two by eight foot cedar planters. 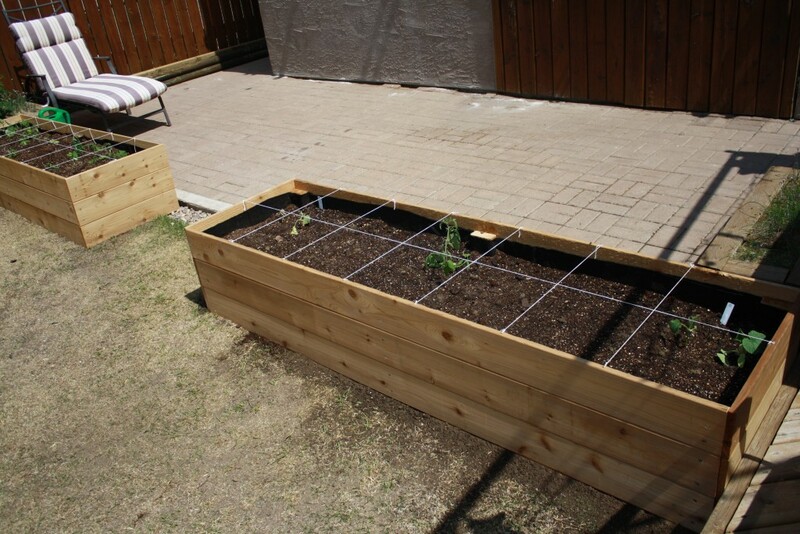 The planters have no bottom and are 16 1/2 inches high, sitting directly on top of the wicking beds. 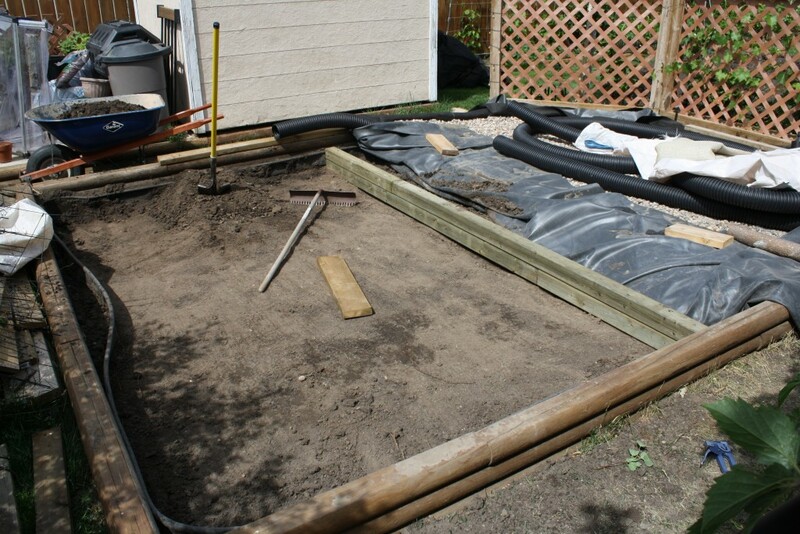 We removed soil to a depth of 12 inches, laid down landscape fabric, EPDM pond liner, another layer of landscape fabric, and leveled gravel to ground level. 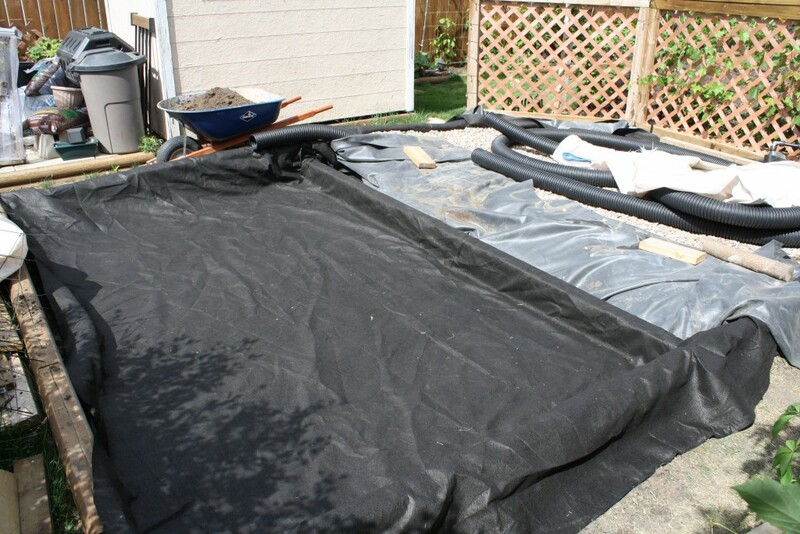 Landscape fabric and pond liner were run up into the planters and stapled to ensure no water loss at ground level. 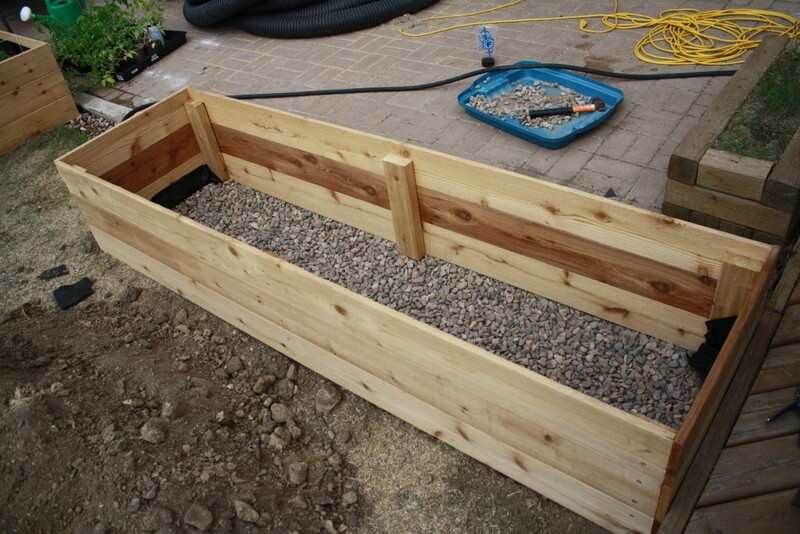 A four inch deep gravel trench between the planters diverts the remainder of the patio water into the wicking beds. 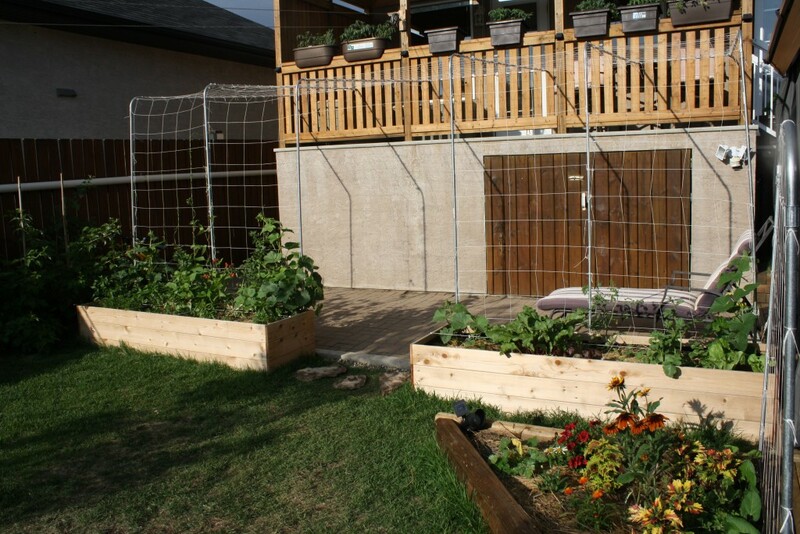 We later added nets to grow melons, squash, and beans which can make use of the radiated heat (lots of it) from the patio, which can also extend the growing season. We had kohlrabi growing until 21 November in the planters, until it was hit by -10 C.
As the back of the house faces directly west, the side of the house gets blasted by the sun pretty well during the summer despite our mature trees. We installed an 84 square foot solar hot water heater with supplies from Thermo-dynamics, a Canadian renewable energy company. A 6 inch wood frame was lagged directly to the house and insulated with 1 inch high temperature ISO insulation. Solar fins were soldered to an upper and lower manifold, connected in a circuit with 3/4 inch PEX pipe. Water is pumped into the lower left corner and is pushed out the upper right corner of the heater. Twin wall polycarbonate was used as the protective cover. The heater is surprisingly good at heating water. 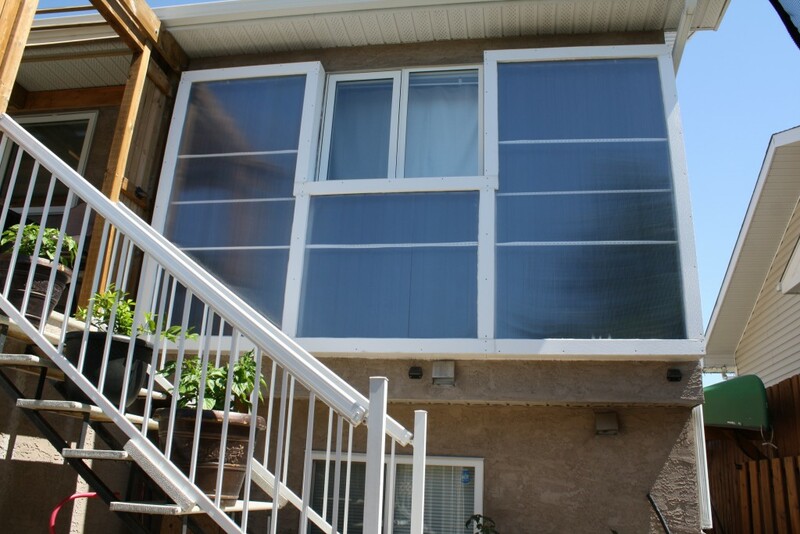 It is capable of maintaining our 300 gallon (1200 L) hot tub between 104 and 110 F on sunny days from April to August. This roughly equates to about 50000 BTU which would otherwise end up in the house. 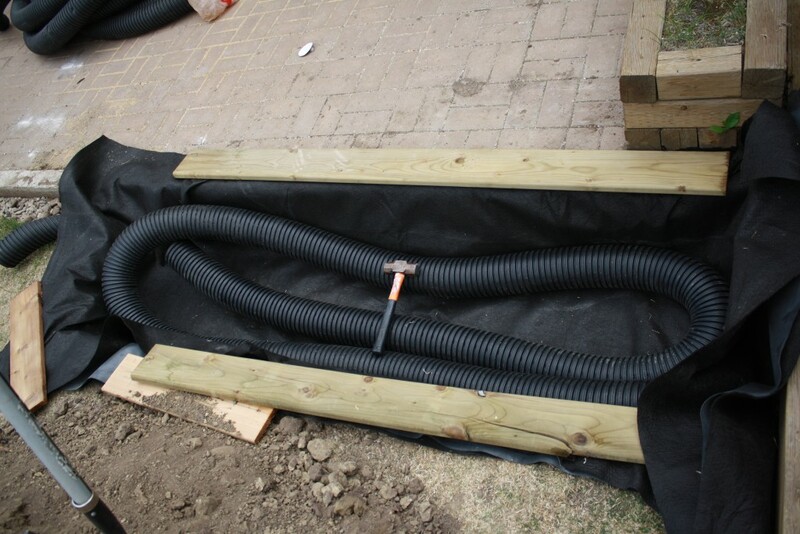 Two PEX pipes run into the hot tub (input and output) to connect it to the heater. A small 12 V heat shielded pump runs water from the heater to the hot tub, triggered whenever the heater is 3 F hotter than the hot tub. When the pump turns off, water simply drains back into the hot tub.